The Jacksonville Jaguars is to be bought by Pakistan-born Shahid R. Khan - something he has coveted for several years. Khan’s love of football was nurtured at the University of Illinois at Champaign-Urbana, and his riches as an auto parts manufacturer made the dream possible. 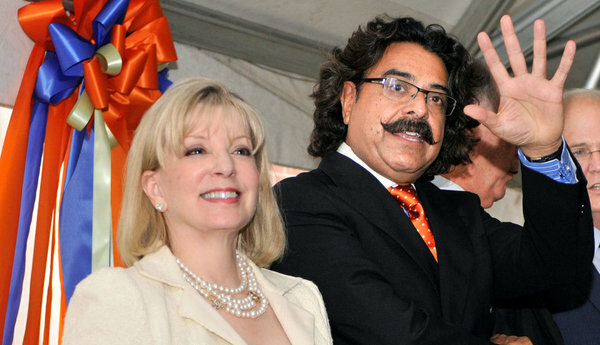 Shahid R. Khan with his wife, Ann Carlson Khan. If Khan is approved, his Pakistani roots will make him stand out among the 32 owners (Zygi Wilf of the Minnesota Vikings is from Germany). But Colangelo said that an owner’s birthplace does not matter. Khan, 61, left his hometown, Lahore, in 1967 to study industrial engineering at Champaign-Urbana. He created a company in 1978 to produce a one-piece bumper that he designed with no seams to rust. Two years later, he acquired Flex-N-Gate and built it into a private company with more than $3 billion in revenue, 12,450 employees and 48 plants in the United States and abroad.